An isometric action game/ dungeon crawler with light RPG and puzzle elements. 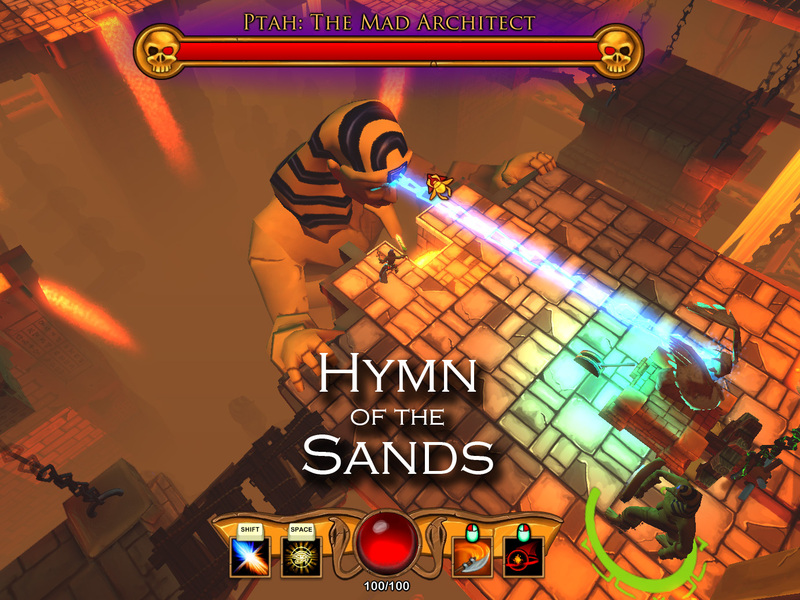 As Egyptian god Osiris awoken from the dead, you battle your way through your tomb on a quest to regain immortality. You can regain your lost powers, upgrade abilities, and shift between the realms of the living and the dead. The game is being developed in UDK by Working As Intended Studios, a team of fourteen graduate students at the Guildhall at SMU. Updated 12/6/2013 Updated 11/23/2013, Updated 11/20/2013. An isometric action game/ dungeon crawler with light RPG and puzzle elements. As Egyptian god Osiris awoken from the dead, you battle your way through your tomb on a quest to regain immortality. You can regain your lost powers, upgrade abilities, and shift between the realms of the living and the dead. The game is being developed in UDK by Working As Intended Studios, a team of fourteen graduate students at the Guildhall at SMU. Updates 11/23/213 Custom install: Shortcut to the desktop and Questionnaire now opens when you play. Visual and audio polish Multiple bugfixes Blade of Isis name change and balance changes Voiceover added Updates 11/20/2013 Once you have played the Beta, please help us by filling out the questionnaire. An isometric action game/ dungeon crawler with light RPG and puzzle elements. As Egyptian god Osiris awoken from the dead, you battle your way through your tomb on a quest to regain immortality. You can regain your lost powers, upgrade abilities, and shift between the realms of the living and the dead. The game is being developed in UDK by Working As Intended Studios, a team of fourteen graduate students at the Guildhall at SMU.Once you have played the Beta, please help us by filling out the questionnaire. Questionnaire now opens when you play. You can now run while using the khopesh!